Kat and Karl : WBW on Thursday? THE HORROR. WBW on Thursday? THE HORROR. since i missed Way Back Wednesday, but do intend to participate in the future, here is a semi-way back kind of picture of me and my hubby. 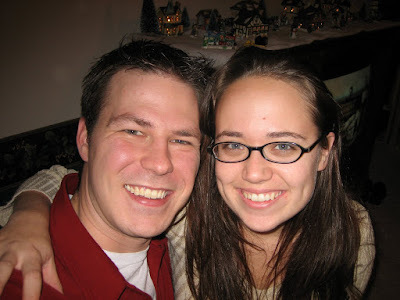 Christmas 2005, shortly after we were married. St. Louis with my parents and family. fed nate a bottle at 3 a.m.
shared his breakfast shake with me. talked to me on the phone the whole six block walk to the dentist office b/c i was nervous. i am sure there is more, but i didn't want to be too moey-goey on my first WBW post. i am finding some great shots of olden days to scan in for future humps days. About this March Madness party...you were there too Kat, just laughing & mingling with everyone like it was nothing out of the normal. Maybe we can pull one off sometime when Matt & I are back in Tulsa, just dont forget Nate & his sippy cup/mug/bottle/whatchamacallit! um, cute. you guys look cutie patootie. i hope your sister gets to feeling better. love love. You're a rockstar. In case you were wondering. cute cute cute...the hubby is a keeper, a bottle at 3 a.m. AND the trash, yep a keeper!